The distinctive ridge around Saturn’s moon Iapetus bears an eerie similarity to equatorial ridges around concretions on Earth. In electrical terms, the similarity could be more than coincidence. Astronomers assure us that Saturn’s moon Iapetus arose from the “circumstellar cloud” that gave birth to the Sun, planets, moons, and all of the lesser objects of the solar system. The critical event was the “gravitational collapse” of the primordial cloud billions of years ago. Since that event, little has changed in the make-up or in the celestial mechanics of the solar system. Both objects on the right are called “concretions”, and their origins are also puzzling. The sandstone concretion (upper image) was found on a farm near the Red River in Texas, and the hematite Moqui marble was found in Utah (lower image). Concretions occur in abundance on our planet and have produced many speculations about their origins. 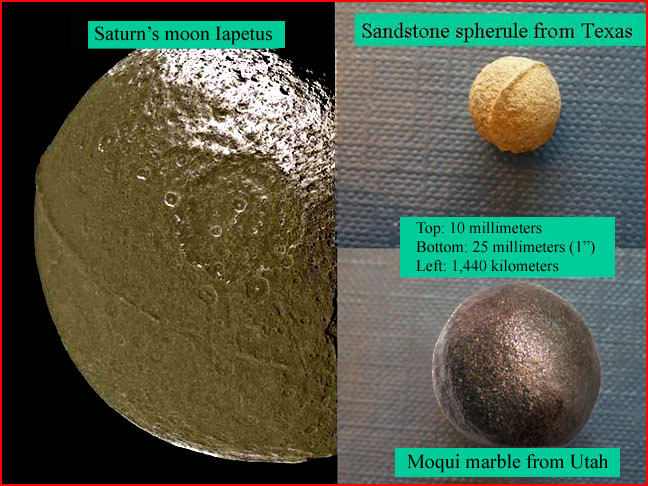 Certainly, in a gravity-only universe, there is no way to relate Iapetus to the formative processes of concretions. In size, the two are separated by up to eight orders of magnitude. Gravity is strong enough to form a sphere from a collection of matter the size of Iapetus, but there’s a lower limit to gravity’s ability to produce spherical shapes. (Asteroids and comet nuclei are below that limit and therefore seldom spherical.) And while geologists have hypothesized, but never demonstrated, the processes that form concretions, they have never suggested that such processes could give birth to Iapetus! The electrical theorists expect analogs on a larger scale because they believe that electric discharge gave birth to stars and planets. Within this framework, equatorial ridges become an important clue, posing a question for experimental research. Can plasma discharge, acting on loose debris, form ridges around the created spheres? In high-energy electric discharge experiments, an equatorial, donut-like torus typically appears at the focal point of the magnetic “pinch”. Similarly, in the hour-glass configurations of various planetary nebulas, a tightly-bound torus appears around the pinch point. Could equatorial ridges on both Iapetus and the concretions above be the signature left by a torus at the higher energy levels of Peratt’s experiments, in contrast to the relatively low energy levels of Ransom’s experiments?